For patients suffering from pressure ulcers or patients at a high risk of developing pressure ulcers, low air loss mattresses can provide an essential form of treatment proven to keep patients at home in their beds and away from the hospital. For most of us, our bed is a place of rest and reprieve at the end of each day. It’s the spot where we can let go of the stress of our to-do list or the big project that’s due next week and drift off into a sweet (or at least restful) slumber. But for patients confined to a bed due to illness or limited mobility, the bed can be a source of anxiety and pain, particularly when pressure wounds arise. Depending on the severity of the wound, patients suffering from pressure wounds can experience everything from mild discomfort to extreme pain, but with proper management (and a prevention program that includes a low air loss mattress), healthcare providers can dramatically reduce the frequency of these unwanted occurrences and help treat them when they arise, ensuring patients get the rest they need on the road to recovery and optimum health. Pressure wounds are soft tissue injuries resulting from constant pressure that leads to lack of oxygen and other nutrients, causing skin cells to die. These wounds are most often the result of sustained pressure, friction, or shear and can lead to many complications like sepsis, cellulitis, bone and joint infection, and in some cases, even cancer. For a more in-depth look at the common causes of pressure, wounds check out this post. 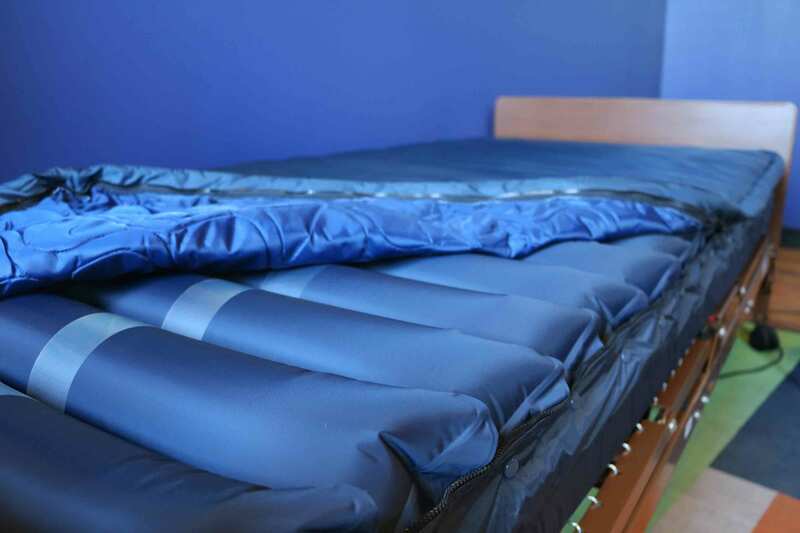 A low air loss mattress is a mattress designed to prevent and treat pressure wounds. The mattress is composed of multiple inflatable air tubes that alternately inflate and deflate, mimicking the movement of a patient shifting in bed or being rotated by a caregiver, never leaving the patient in one position for any extended length of time. This action relieves pressure under the body - particularly in parts with less padding, like hips, shoulders, elbows, and heels - and helps ensure proper air circulation, helping to prevent, manage, and treat the occurrence of pressure wounds. Low air loss mattresses can be used for both the prevention and treatment of pressure wounds, and are well suited to any patients susceptible to these events such as those who are immobilized or lack adequate sensory perception (e.g. those with spinal cord injuries or neurological conditions), or patients with medical conditions affecting blood flow; essentially any patient that is unable to shift and reposition themselves while lying in bed. N.B. For patients with a stage 3 wound or multiple stage 2 wounds, a low air loss mattress is absolutely essential for both comfort and treatment. As we learned in this post on the importance of gel mattress overlays, the NIH’s National Heart, Lung and Blood Institute says, “sleep plays a vital role in good health and well-being.” Sleep is involved in many essential processes, including the healing and repair of blood vessels (key when dealing with pressure wounds), so taking care to create the best possible sleep and resting environment for patients should be a top priority for healthcare providers. Among other benefits, quality sleep ensures optimal immune function, a healthy metabolism, and a strong memory. When patients are deprived of sleep they may have trouble controlling their emotions and coping with change (concerning for individuals dealing with health problems or long-term illness). In addition, sleep deficiency has been linked to depression and suicide, so to mitigate any compounding conditions, caregivers need to make use of every resource available to provide the best possible environment for patients in their care. Will Medicare cover the cost of a low air loss mattress? The short answer is, it depends. Medicare is a quite particular about who qualifies for a low air loss mattress, and this particular class of durable medical equipment has one of the highest rates of rejection due to insufficient documentation. But by following the guidelines closely, and taking advantage of helpful hints, like those provided by Wound Care Solutions, applying for coverage can be easier than you think. Frequent Changes in Body PositionAll medical records and charts must demonstrate that the patient requires frequent changes in body position or have an immediate need for changes in body position. Need for ElevationMake sure to document that the patient needs to have their head elevated more than 30 degrees and list the reason(s) why. This is one of the key elements in whether the patient qualifies for coverage. Medical Condition Requiring Frequent Changes in Body PositionIn order to qualify for coverage, the patient must have a condition that requires their body to be positioned in ways not possible in an ordinary bed. Make sure to outline the condition and explain why a regular bed won’t suffice. Changes in Body Position to Alleviate PainIf the patient experiences pain in certain positions, make sure to document it. List how repositioning the patient will alleviate these pains and why they cannot be alleviated in an ordinary bed. The Need for Traction EquipmentIf the patient requires traction equipment, detail why traction equipment is necessary. Coping with illness and immobility is challenging enough without the added stress and pain of pressure wounds. Keep patients as comfortable as possible, using every available resource, including low air loss mattresses, and start them on the road to good health. If you know someone experiencing, or at risk for, pressure wounds and would like to learn more about how low air loss mattresses can help, contact Wound Care Solutions today. We offer a variety of equipment and products to keep patients safe and comfortable on the road back to health. Hypertension and Wound Healing: How Does Hypertension Affect Pressure Ulcers? Are You One of 1 in 4 Americans Not Getting Enough Physical Activity?